Fascinated as I am by the cute little Olympus PEN digital cameras, I thought it was time to obtain one of the original film bodies. Thanks to a contact in Denmark, one arrived just today. Along with the camera came a 38mm f/1.8 lens, the standard glass included with a camera kit back in the day. The first thing I did was admire the camera itself (more on that in another article) and the second thing I did was try out the new lens. 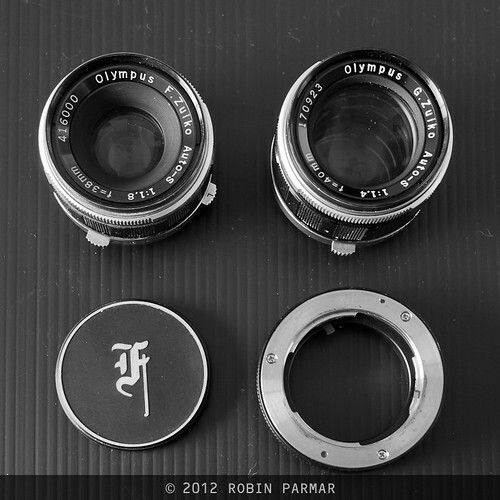 Since I already own and love the 40mm version, I was very interested in comparing the two. Pictured above are the two lenses, an original lens cap, and the adapter that allows use on the digital range of PEN cameras. Read on for lens details and some pixel comparisons. As PEN system evolved, no fewer than four 38mm lenses were released. This focal length offers a 43 degree angle of view, hence equivalent to the 55mm focal length on 35mm film, more telephoto than a true normal lens. Combine this with the fact that the PEN film frame is oriented vertically, since it's a 35mm frame divided in two, and one sees that this system is particularly suited to portraiture. E Zuiko AUTO S 38mm F2.8, a pancake lens only14mm long and 70g in mass! I own the 38/1.8 and 40/1.4, both of which have a close focus distance of about 35cm and 43mm filter screws. The 38/1.8 weighs 135g and is 35mm long. The 40/1.4 weighs 30g more and is 8mm longer. 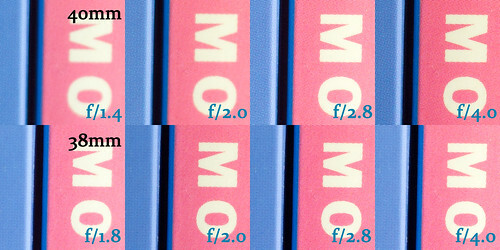 As mentioned, the former lens is FOV equivalent to 55mm on full-frame 35mm, while the latter is 58mm. In order to test image quality I set up my E-PL2 on a tripod with the PEN F adapter. I fixed ISO at 200 and the shutter speed at 1/100s. I used a remote trigger to control a flash I diffused and bounced off the ceiling, for the most even coverage I could. I am not so interested in stopping down beyond f/4.0. For one, lenses become much the same in performance, and for another diffusion starts to set in pretty early. Remember that the digital MFT sensor is not as large as even the PEN film frame. I focused on a fixed spot, using the maximum magnification on the LCD. The timed shutter release was used to avoid vibration. This method should remove most extraneous factors, providing a decent test. Here's Schweppes the cat sleeping at a distance of 152cm from the sensor plane. I focused on her nose. Click through to Flickr where the full-size image is available. These are 100% crops from the focus point, near the centre of the frame. The original RAW file has been processed through Adobe Camera RAW but with totally neutral settings, not even the initial sharpening I apply to every digital image. The only thing I did was increase the exposure by 1EV, consistently for each image. Real-world images, processed in accordance with optimal sharpening and individual exposure curves, etc. will look better than this. I notice slight colour balance changes, which I cannot account for. The wide open 40mm lens is quite soft, something I have noticed in daily usage. Basically, I don't use f/1.4 unless I have absolutely no other choice. 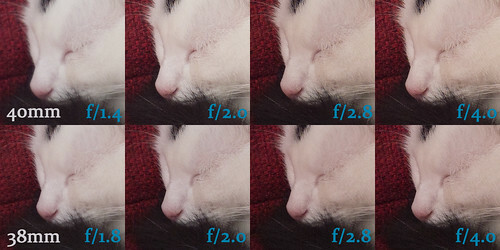 f/2 is distinctly better. Even the f/1.8 setting on the 38mm lens can be improved by stopping down one-third EV to f/2, though of course the improvement is not as significant. Henceforth, contrast and detail are very good, improving steadily but slightly to f/4. The 38mm lens seems ever so slightly softer to me. The f/2.8 image definitely so. Perhaps there was slight cat movement here. Given this, I decided to redo the sequence, switching to my standard bookshelf shot. I applied the same method as before, at a distance of 38cm to the subject, very near the closest possible. The results are quite different from before. First, the 40mm at f/2.0 looks quite poor, which must be a focus error, or perhaps a bit of vibration in the tripod. I should have taken three shots at each setting and chosen the best of each, but I was trying not to extend the process. Apart from this, the contrast and acutance of the 38mm looks better, but there's more detail in the 40mm. What I find most intriguing is the blue spine. Notice how different the screen appears. The 40mm shows a square grid of ink, which would seem to be accurate. The 38mm emphasises the (more or less) horizontal lines. How odd! I would tend to think that aliasing is the answer, but that should be a function of the camera sensor, not the lens. From this test I would choose the 38mm as the best image at all apertures except f/4.0. But I may have to perform another one tomorrow.